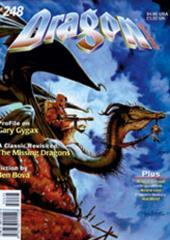 #248 "Profile on Gary Gygax, The Missing Dragons"
A classic article returns with three new dragons for the AD&D game. Teaching an old dragon new tricks is as easy as perusing this menu. Everything--and we mean everything--you’ll ever need to know about gems. Orion must help a young king find both a weapon and his own courage.